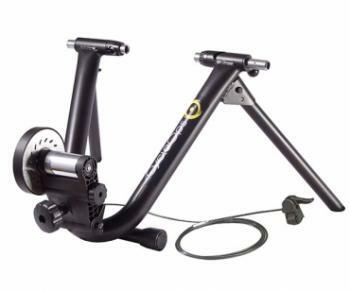 The CycleOps Mag+ with adjuster is exactly the same turbo trainer as the Classic Mag, albeit a slightly redesigned 2013/14 model, except it comes with a handlebar mounted resistance lever. This addition over the lower price model is very useful and means you can adjust the resistance at any time without leaving the saddle. The Mag+ offers 5 different resistance levels powered by a magnetic brake. This is a quality low cost trainer brought to you by one of the biggest brands, and this trainer comes with a lifetime warranty. The Mag+ is a good trainer for getting a solid workout at home, it is easy to attach to your bike and simply requires that you place your back wheel into the trainer frame and push it against the magnetic rear brake. 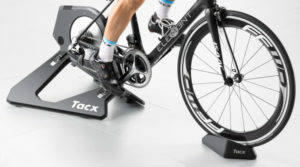 Like all trainers of this type (which is most of the trainers out there), it is best to use it with some type of riser block on the front wheel. CycleOps do their own front wheel blocks, and these help position the bike in a more realistic, normal riding position and counteracts the higher rear wheel position. However, the trainer works perfectly without this front wheel block.